Happy St Patrick's Day. My perfect green beverage to cheers to with this day? No, not green Guinness. Green smoothies and juice! And today I'm saluting Green Smoothies. I've always loved smoothies. And now I love them in shades of emerald, spring green, jade, leaf, grass and kelly green. This spring and summer 2012 I predict a building trend is in the works for Green Smoothies. Join in the green celebration and try my green recipes and tips..
tip: chill the orange, grapes and banana for a cooler end product smoothie. Note: you will need a high speed blender like a Vitamix to properly blend all these whole foods into creamy bliss. If you are looking to buy a Vitamix, please read my Vitamix review – posted to my blog Healthy Happy Life. And use this Vitamix online store link for free shipping on your purchase – $25-$35 value depending on where you ship. What is a "green smoothie" you ask? Well it is a smoothie that is green! As opposed to fruit smoothies that may be pink, blue, orange or yellow - green smoothies are green because they contain something green. Most likely a veggie like kale, cucumber, kiwi, parsley or spinach. 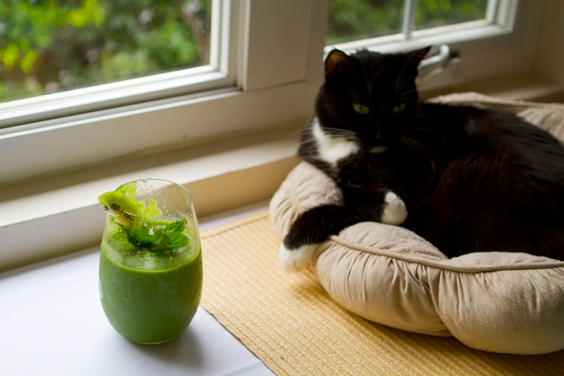 Green smoothies are similar to 'green juice' which I describe here. But the difference between a green smoothie and a green juice is simple. Fiber! Bulk. Wholeness. Green smoothies use (and keep) whole foods. They keep in the fiber. 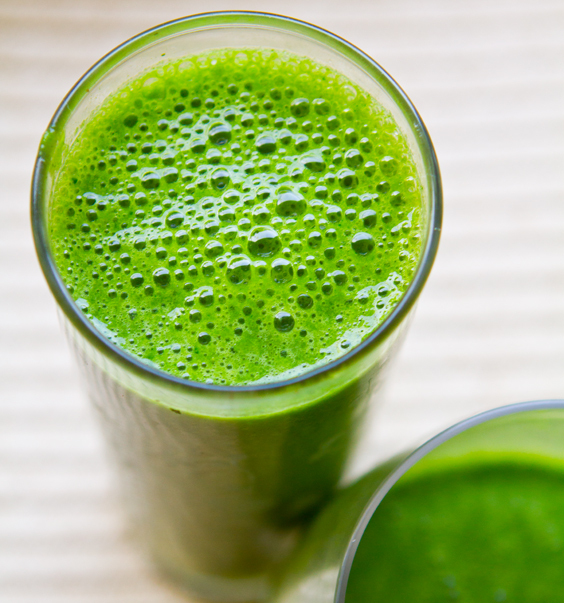 Instead of juicing a bunch of kale into a small cup of dark green juice - you are pureeing the kale into a smooth, creamy beverage - thicker than juice and sometimes as frosty as a traditional fruit smoothie. Your call. 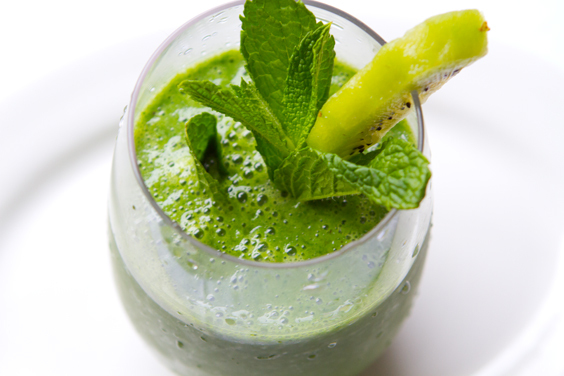 Green smoothies can be super chilled, room temperature or mildly frosty. Thick or thin. Green smoothies can be made with a high speed blender like a Vitamix (more on tools below my recipes.) And since more and more people are buying high speed blenders, I have seen more and more people falling in love with green smoothies. 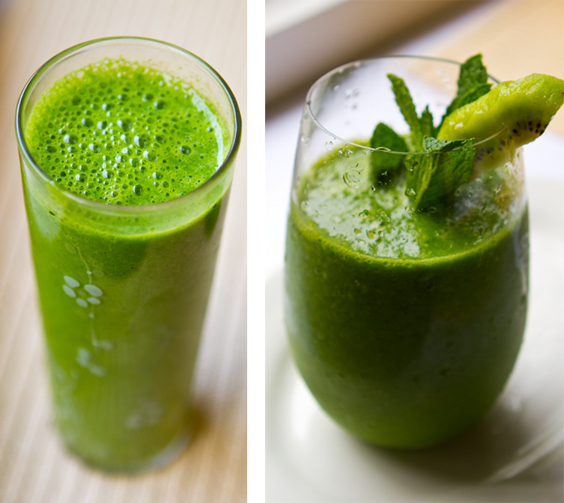 Green smoothies carry many of the same common myths that green juice carries. First of all, people think that just because the color is green, the smoothie will taste grassy, bitter and undrinkable. Not true! 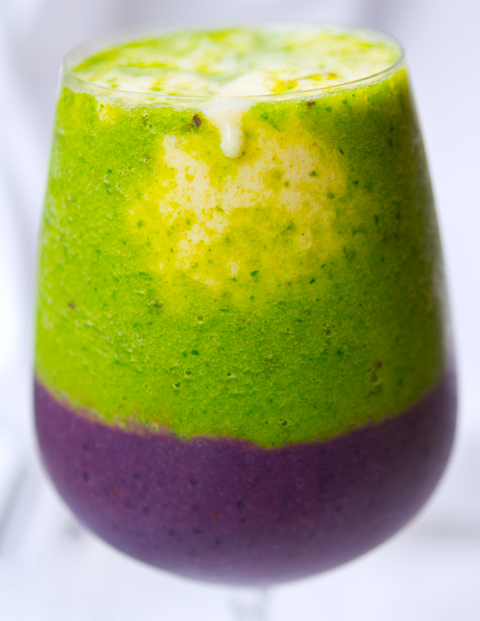 Most green smoothies are in fact slightly sweet tasting because of their blend of fruits and veggies. Flavor. 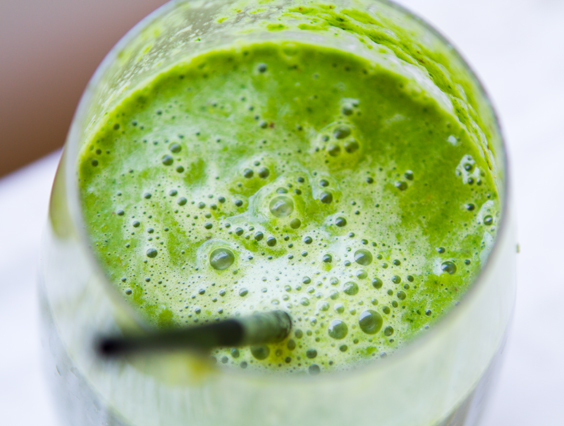 The secret to a good green juice is getting that perfect blend of fruit and veg. Sweetness with grassiness. A blend of zesty. Sassy. Spicy. Salty. And even sourness. The complexity in green juice flavor can be diverse or simple. Many flavors or just two. Experiment with combos and slowly you will learn the different flavors that show up as you blend in various ingredients. Some of my favorite green smoothie ingredients include: kale, parsley, oranges, mandarins, pear, grapes, spinach, apple, lemon, lime, wheatgrass juice, mint, kiwi, banana, pineapple, blueberry, strawberry, mango, nut milks (homemade is best! ), soy and hemp milks, coconut water, coconut water ice cubes, grapefruit, cucumber ...and on and on and on. Green Smoothie Recipes. I'm just starting to post more green smoothies, but here are a few I love. What is your favorite green juice recipe? Please share in the comments! Kiwi pineapple mint (recipe below)..
Green Smoothie Tools. I will say that to properly blend some hearty whole food ingredients like kale, apples, oranges and tough veggies - you will need a high speed blender. A $19.99 plastic blender that is fine for blending juice and bananas - will not be able to puree the whole foods properly. Plus the Vitamix 'plunger' helps to mix those bouncy leafy greens into the blend! Vitamix Smoothies. And I know I sound like a broken record - but a high speed blender like a Vitamix really is the best kitchen appliance investment I have ever made. I adore mine. In fact, my mom stayed at our place for a while to 'housesit' for us and she fell so in love with my Vitamix that she bought one for herself. Actually, she took mine and I upgraded. If you want to buy a Vitamix online, you can use my code for free shipping. So CHEERS to green smoothies!! 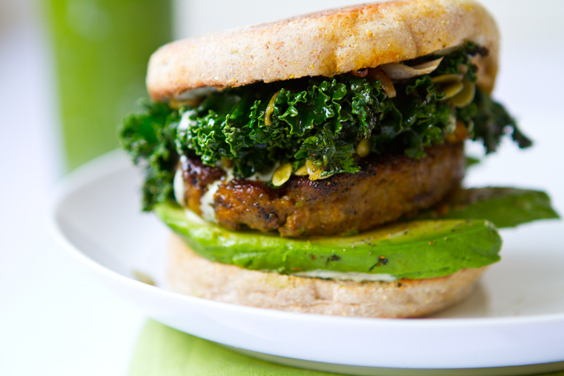 And maybe pair your smoothie with this Vegan Shamrock Breakfast Sandwich..
One more look at that pretty ipad. 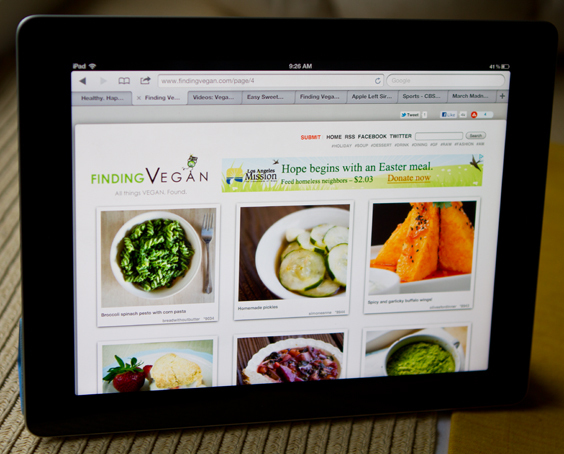 FindingVegan.com on my IPAD!..